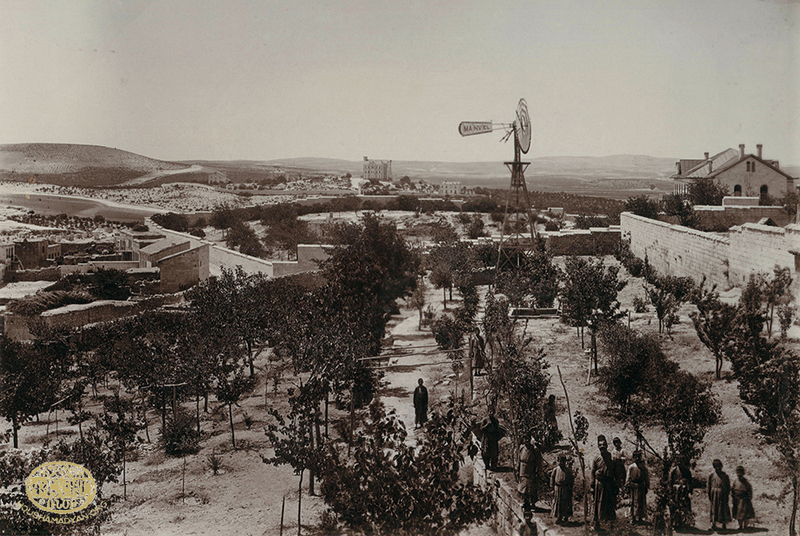 Ayntab, circa 1919-1920. 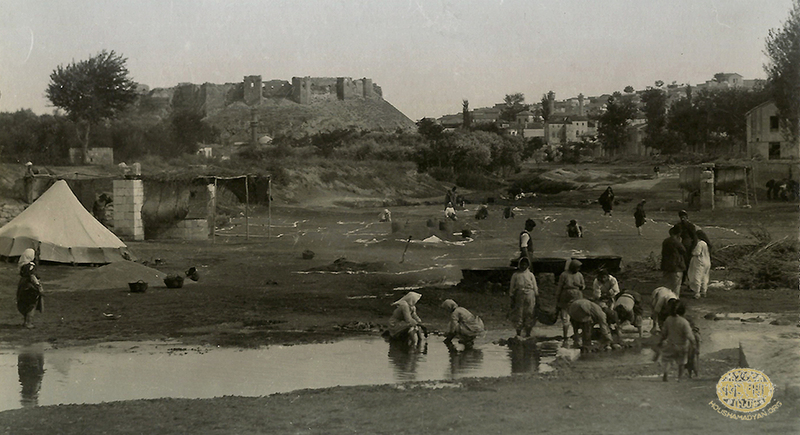 On the left, in the background, is the city’s historic fort. (Source: Yates County History Center). The City of Ayntab was built on a plateau at an altitude of 1,500-1,900 meters above sea level, surrounded by hills and mountains. The area’s climate was temperate and salubrious – warm in the summer, cold in the winter, more continental than coastal, with medium humidity and moderate amounts of rain. However, occasionally the area was susceptible to torrential downpours on the one hand, as well as periodic periods of drought on the other. The area of Ayntab was not blessed with much fertile land. There were large fields and orchards in the valleys and highlands around Ayntab, but their fate was closely tied to the rains and weather patterns. There were some small streams and canals in the fields, and the rare wells that had been dug into the ground to access groundwater, which were used to water orchards of fruit-bearing trees. Despite all efforts, the local harvest was never enough to satisfy the local demand, and food was imported from Berejig and Hromlage (Roumkale). On the other hand, every home in Ayntab had a garden, where one could find grapevines, fruit trees, and other plants and herbs. Sumac grew on the flanks of the city’s limestone hills. In the countryside surrounding the city, villagers grew pears, almonds, pomegranates, apricots, walnuts, etc. The Sajur Valley was fertile, and various cereals, vegetables, and fruit trees thrived there. The markets featured many shops selling produce and food, including butchers’ shops, bakeries, confectioneries, shops that sold assorted nuts, and an arak distillery. There was also a thriving market in kitchen utensils, including clay, varnished pots, plates, etc. There were also craftsmen who worked bronze and pewter, and produced wares of various types, including tubs, pots, braziers, samovars, specialized items for use in distilling arak, etc. The blacksmiths produced many items for daily use, including spoons, ladles, plates, pails, and water pumps. 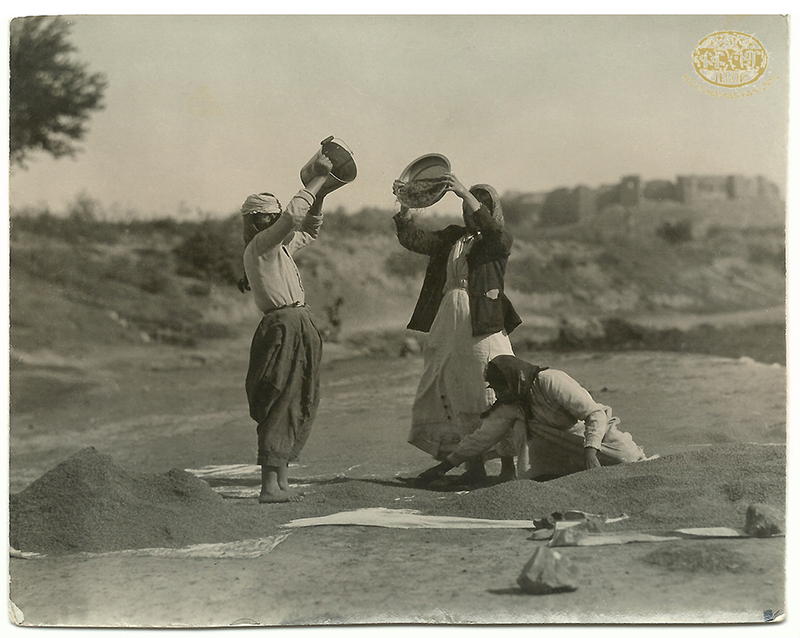 One of the interesting customs of Ayntab involved the milling of harvested wheat. There were several devlibs in the city, where the wheat was wetted and the husks were removed. Devlibs were a sort of horse-powered mill. On certain days, the people of the city would congregate at the devlibs and bring their harvested wheat with them. The events would be marked by a jovial atmosphere, games, feasts, and song and dance. During the harvests, it was customary for the courtyards of homes to be full grapes being dried to be made into grape molasses, raisins, grape leather, sharots, etc. Grape products were very profitable. The people of Ayntab were fond of life. The toasts they made while drinking are evidence of that – “To your health,” “cheers to you,” “to a pleasant life,” “may God grant your home unending joy,” “cheers to the drinker,” “cheers to those who are absent,” “cheers to the brave drinker,” etc. 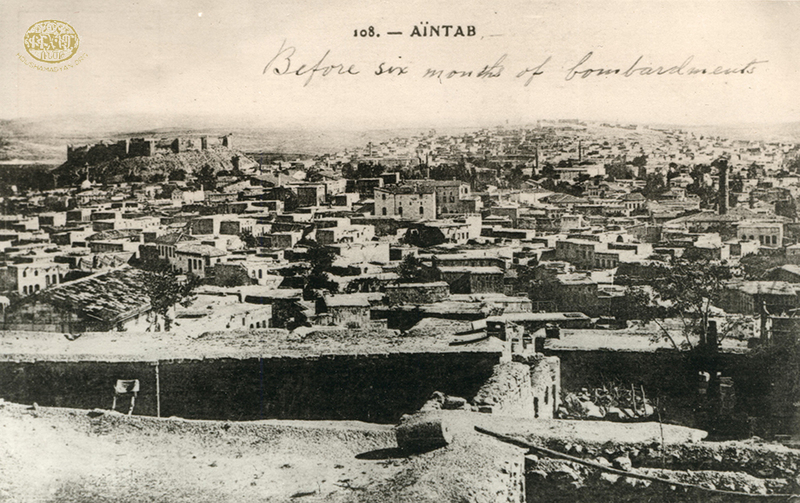 Ayntab, circa 1919-1920. 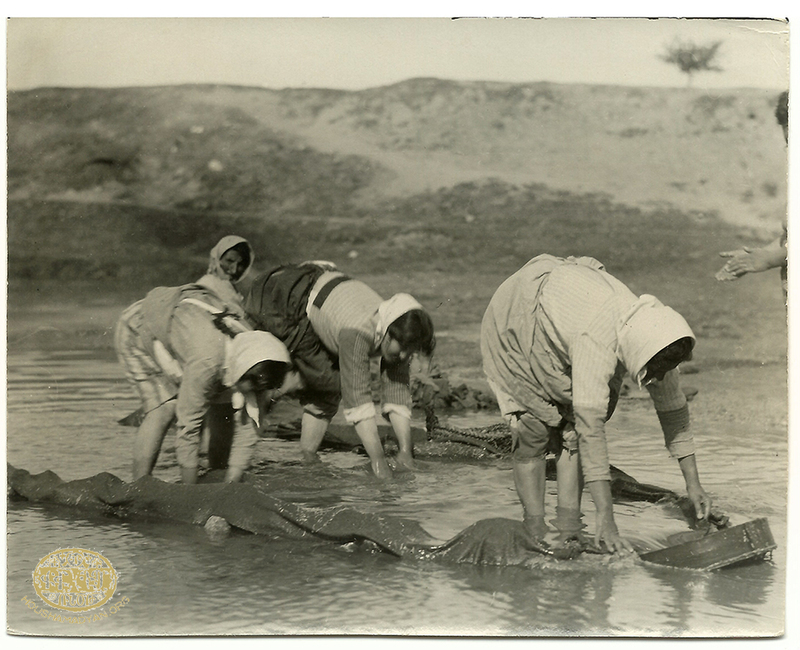 Women photographed while winnowing wheat. On the right, in the background, is the city’s historic fort (Source: Yates County History Center). Giragi ov bani, vor yes banem? 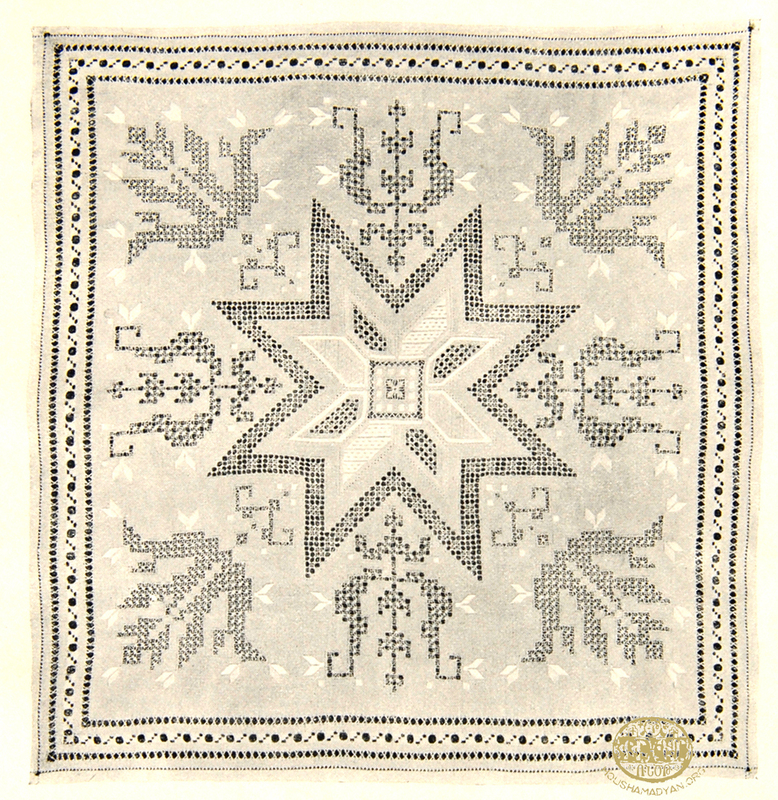 Ayntab, circa 1919-1920. 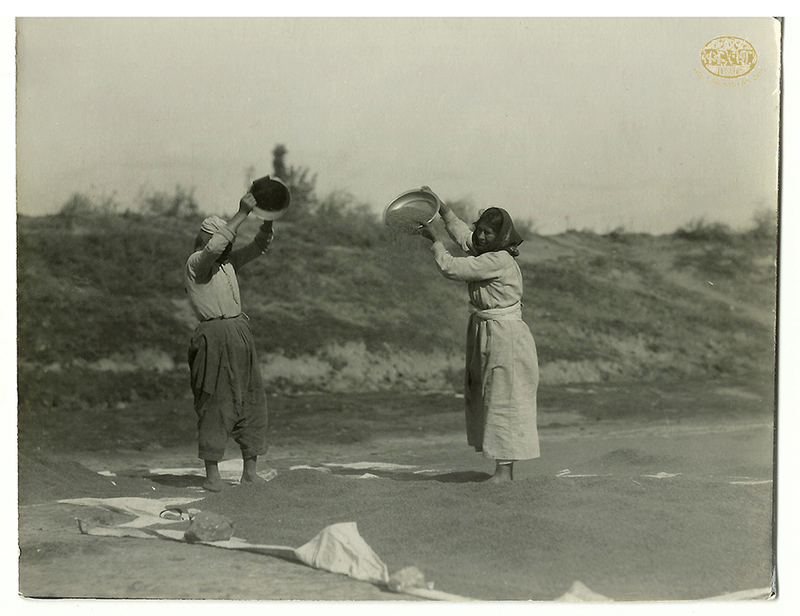 Women washing bulgur (Source: Yates County History Center). In Ayntab, pilafs were common side-dishes served with meals. Most of these pilafs had coarse wheat (bulgur) as their main ingredient. Generally, pilaf dishes were cooked with a generous amount of oil, but on Lenten days, the oil was replaced by vegetable oil. Cook the vermicelli in oil until red, then add the coarse wheat. Cook in the oil for a few minutes, then add the water and salt and cook on a low fire until the water is completely absorbed. Serve with herbs, onions, pickles, and tan (doogh). Rice pilaf can be prepared following the same recipe, replacing the bulgur with rice. Chop the onion and pepper and fry with the meat. Add the tomatoes, tomato paste, water, and spices. Boil, then add the cracked wheat and cook on a low fire until the water is absorbed, but remove from fire before it loses all moisture. 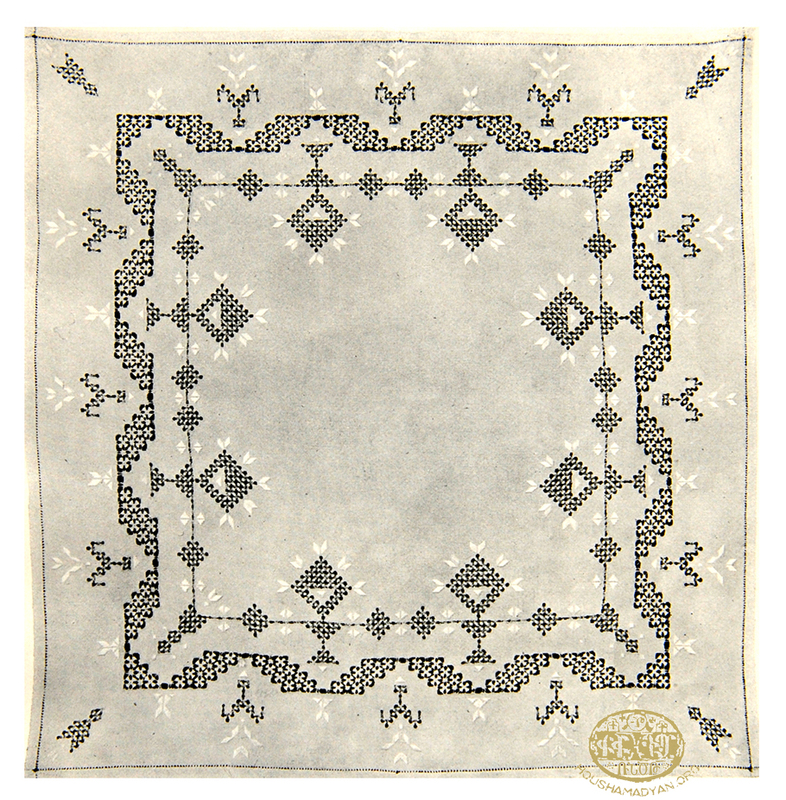 Ayntab, circa 1919-1920. 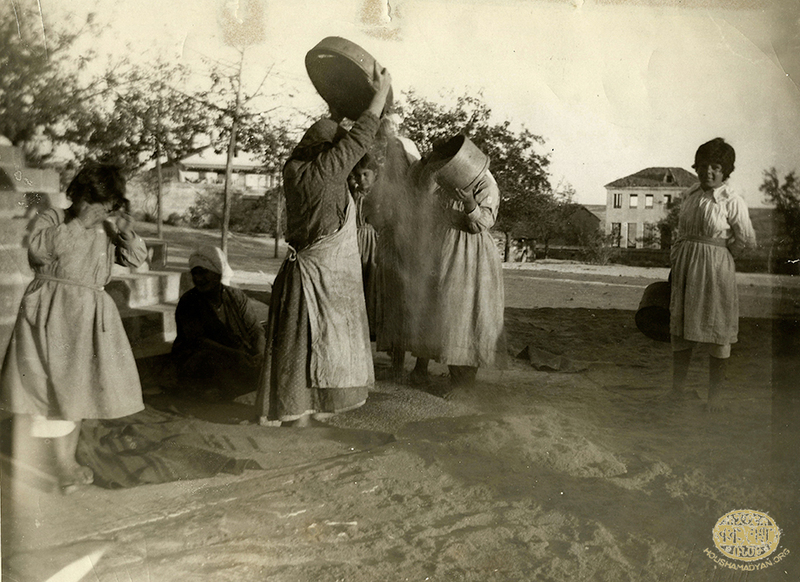 Women photographed while winnowing wheat (Source: Yates County History Center). Chop the onions for the filling, and fry alongside the seasoned meat, in the meat’s own oil. Then let it cool down. For the dough, grate the onions, combine with the meat and fine wheat, and knead while wetting constantly. Roll the dough into lemon-shaped balls, the fill them with the filling. Either fry or boil the resulting koftes. Sini kofte is prepared with the same ingredients that are used to prepare ichli kofte. However, the dough is laid out onto an oiled pan, the filling is spread over the dough, and then the remaining dough is flattened with the hands and used to cover the filling. The resulting dish is kneaded with the fingers, cut across diagonally with a knife, and then baked with bits of butter placed on top. Traditionally, this meatball soup was prepared during the New Year’s holidays. After attending the first mass of the new year, the family would gather and enjoy the warm soup. Combine the tallow or butter with the ground hot red pepper, and roll into hazelnut-sized balls. Freeze. Boil the oiled meat. Knead the tenderized meat, alongside the seasonings and wheat, wetting the fingers regularly, until the resulting mixture has the consistency of dough. Roll into walnut-shaped balls, then insert the balls of tallow or butter into them. Mix the yogurt, egg, and farina, and boil. Add the boiled meat and stock, and continue to boil. Now the meatballs can be added, and boiled in the soup. Fry the ground mint in oil and add to the soup before serving. Chop the tomatoes and onions and mix with the wheat, then add the pastes and knead with the fingers, adding water as needed. Warm the oil, pour it over the kneaded kofte, mix, and serve. Knead the contents of the kofte and roll into walnut-sized balls. Chop the onions and boil in water, then add the chickpeas and koftes and continue to boil. Separately, heat up the tahini, add the mint, and then pour some the water in which everything was boiled over it. Finally, add this tahini mix to the soup. This dish was usually prepared using old bread found around the home. Chop the vegetables, crumble the bread into them, add the oil, the seasonings, and the grated cheese, and knead. Form into sekhems (individual finger-shaped, bite-size morsels) and serve. Fry the onions, add the tomato paste, mint, and mashed garlic, boil, and then crumble the bread into the dish. For garnish – pepper, scallions, and other herbs. Chop the tomatoes and onion and add to the wheat, allowing the wheat to absorb the vegetables’ juices. Then add the pastes, the tahini, and the lemon juice, also adding water. Garnish with chopped pepper, scallions, and other herbs before serving. Chop the meat and fry it in its own oil, add the onions, and continue to fry while stirring. Mix the pastes with water add to the mixture, season, then fry on a low fire. Serve with a bulgur pilaf as a side dish. Chertma was prepared using the innards of the zucchinis used to make dolma. Therefore, people would make this dish the day after making zucchini dolma. Fry the onions, add the tomato and pepper pastes, season, and add the water. Then add the zucchini innards and cook on a low fire. Fry the onions, then add the diced zucchinis. After frying, break the eggs over the meat and zucchinis, season, and serve. Heat up the oil, then add the scrambled eggs and fry. Serve after covering the omelet with the mixture of yogurt and mashed garlic. Chop the onion and cook alongside the meat. Season, then add the scrambled eggs and fry. Serve after covering the omelet with the mixture of yogurt and mashed garlic. Fry the onions, add the chopped tomatoes and pepper, then the scrambled eggs. Sprinkle with allspice before serving. Fry the onions, and add the spinach (which should be half-boiled and strained). Continue to fry, then add the eggs. Removed the seeds from the dates, fry in oil, and then serve with bread in a sandwich. Each family prepared ghavurma at the end of autumn. They would then preserve it in jars for the winter. Chop the meat into large pieces, sprinkle with salt, and leave in a colander for an entire night. On the following day, wash the meat and boil it. Remove from the water, wait until it cools down, then cover with lard or oil and fry for some time. Once it’s been well-fried, add slices of quince and fry for another 15 minutes. The resulting meal was poured into jugs, and then liquid oil was added before the jars were placed in a cool and dark place. Chop the onions, then place all of the ingredients in a pot. Add a generous amount of water, and cook on a low fire, taking care to add water if the mixture becomes too dense. The name of this dish translated into “tail soup.” In the summer, when the skins of eggplants were dried to make dolma, the innards and stems of the eggplants were also dried, and preserved specifically to be used in this dish. The dish was eaten using bread. Chop and boil the eggplant, then add the coarse wheat and seasonings, and continue to boil. Mix water and tahini, and add the mixture to the soup. Serve with mashed garlic. Beat the egg, mix with the yogurt and farina, and boil. Boil the rice (or wheat), then continue to boil all of the ingredients together. Meanwhile, fry the mint in oil and add to the boiling soup. Tanabour (doogh soup) was prepared around Easter, by adding yogurt to the boiling wheat. Soak the chickpeas overnight. Chop the meat and boil with the chickpeas. Add the paste, the zucchinis, and continue to boil. Mash the garlic, fry in oil with the mint, and add to the soup. Serve with bulgur pilaf on the side. Chop the meat and boil. Add the pastes, the eggplant chopped in cubes, and continue to boil. Mash the garlic, and fry in oil with the mint, then add to the soup. Serve with bulgur pilaf. Some also prepared this dish with fresh tomatoes and peppers. Fry the onions and meat together, then add the eggplants diced into cubes, as well as the chopped tomatoes, peppers, and paste. Season and continue frying until ready. Chop the meat and boil, then add the chopped carrots and fresh peas and continue to boil. Finally, add the pastes and seasonings, and cook for another few minutes. Serve alongside rice pilaf. A scene from Ayntab, circa 1919-1920 (Source: Yates County History Center). Half-boil the beans. Chop the meat into small pieces and fry, then add the beans to the meat, as well as the garlic, the pastes, and the seasonings. Continue to cook on a low fire. Serve with garlic yogurt and bread, or bulgur pilaf. Soak the white beans overnight. Chop the meat and fry it in its own oil, then add water and the beans and boil, adding the pastes and seasonings along the way. Serve with rice pilaf. Boil the meat and the pounded wheat separately. Mix the lemon juice and mashed garlic. Serve with the wheat at the bottom, topped with the meat and the juice in which it was boiled, and the lemon juice/garlic mash on top. Fry the ground meat in its own oil, then add the rice, pine nuts, allspice, and water. Continue to cook until the water is completely absorbed, and allow it to cool down. Cut the flank meat, fill it with the rice and meat, sew it shut, and then boil it in saltwater. Soak the chickpeas with the pastes, then add the chopped meat and boil. Half-boil the lungs and liver, keep the water, chop them, and fry in a small amount of oil, adding onions cut in rings, until the onions soften. Mix with the tenderized meat and fine wheat, and roll the resulting mixture into balls. Immerse the balls in the water in which the meat was boiled, boil again, and right before removing from the fire, mix in the mint fried in oil. This dish may be prepared with or without meat, and using seasonal vegetables. Chop the vegetables, and arrange in the pot in rows, adding seasonings and butter to it. Steam boil in a covered pot, on a low flame. Grind the meat and onions together, add the seasonings and the wheat, and grind again. Prepare the kebabs and skewer them, then remove from the skewers, arrange on an oiled pan, and bake in the oven. Serve with yogurt, and dip the kebabs in the yogurt while eating. Some people enjoyed this dish with onion piaz, while other preferred adding chopped tomatoes, peppers, and onions. For the onion piaz, chop two onions, season, and add ground red pepper, sumac, mint, and oil. Chop the liver, season, arrange on skewers, and grill. Mix the meat with chopped onions and rice. Slice the eggplants into slices with a width of two centimeters. Arrange in the pot, adding the meat. Cover with tomatoes and peppers, and cook on a low fire after covering the pot. Chop the meat, and fry in its own oil alongside the onion and seasonings. Add the rice, mix, and fry for a few minutes. Then add the water, and continue frying on a low fire until all of the water is absorbed. Chop the ingredients and mix together. Roll the dough into walnut-sized balls, then use a rolling pin to flatten the balls of dough. Now, spread the ingredients on the flattened dough, then bake in an oven. It is suggested to serve after adding slices of eggplant and rolling the lahmajun into a sandwich. Fry the meat in its own oil, boil the rice, and mix the two together once they have both cooled down. Flatten the dough with a rolling pin, then cut the dough into circles, fill them with the meat filling, then fold the dough into half-moon-shaped dumplings, pinch the corners, and fry in hot oil, making sure to fry both sides. Grate the cheese and mix with the other ingredients. Flatten the dough with a rolling pin, cut into circular pieces, fill with the filling, then fold the dough into half-moon-shaped dumplings, pinch the corners, rub with eggs, and bake in the oven. Boil and strain the Swiss chards. Mix with the fried onions, then add the remaining ingredients. Flatten the dough with a rolling pin, cut into circles, fill with the filling, then fold the dough into half-moon-shaped dumplings, pinch the corners, sprinkle the dumplings with some water, and bake in the oven. Boil and strain the Swiss chards, fry with the onions, then add the remaining ingredients. Mix the yogurt and the yogurt curds, add the chopped cucumbers and garlic, and season with mint. Boil and strain the Swiss chards, then add the remaining ingredients. Chop the vegetables and onions, add the seasonings and flour, then the eggs. Pour the resulting mixture into a hot pan by the spoonful, and fry both sides. Some used boiled and strained Swiss chards instead of parsley to make this dish. Roast the eggplants, clean, then dice into cubes. Chop the remaining ingredients and add to the eggplants, season, and serve. Roast the cereals, grind, then mix together. Add the seasonings and preserve in glass jars. Add oil before serving. Chop the meat and boil, then add the chopped leeks and scallions and continue to boil. Beat the yogurt and eggs together, then add the mixture to the boiling soup. When everything is cooked, fry the mint, add to the soup, bring to a boil again, and serve alongside bulgur pilaf. This dish was usually served during celebrations and feasts, such as weddings and other special occasions. Season the ground meat and cook in it owl oil. Boil the chicken, then chop and fry in oil. Fry the pine nuts in the same oil. Boil the rice (or wheat) in the broth. 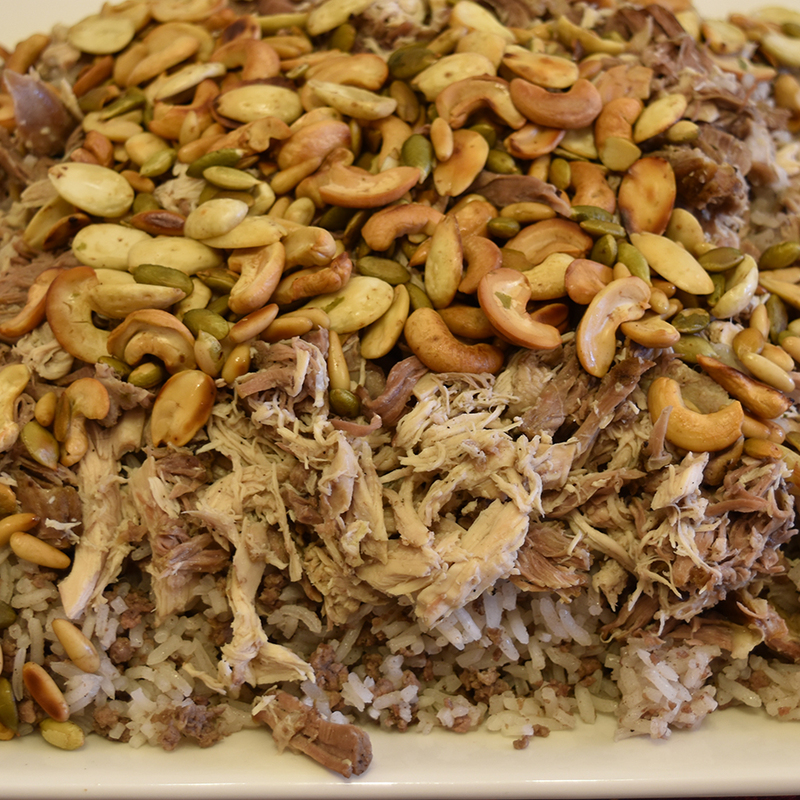 Transfer the fried meats and pine nuts to a frying pan, add the boiled rice, cover the pan, and fry for 10-15 minute. Let it rest. Flip the contents of the pan before serving, so that the rice or wheat is on top, and the meats on the bottom. Chop the liver and fry in melted animal fat, add the seasonings and chopped onions, and continue to fry. After removing it from the fire, mix with the vegetables. Serve alongside sula salad (described below). Chop the vegetables, then add the water and lemon juice. 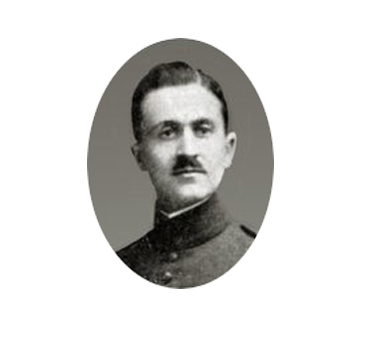 Ayntab, circa 1919-1920. 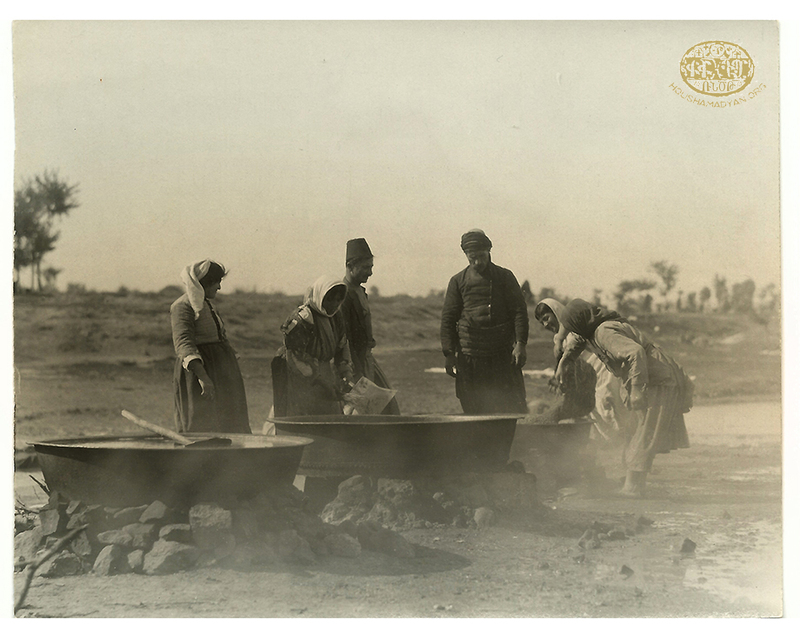 Women and men boiling wheat in large pots to make bulgur. (Source: Yates County History Center). Dolmas were ubiquitous in the kitchens of Ayntab. The dolmas, koftes, and sarmas of Ayntab are almost a cultural cliché. Alongside dolmas that featured different types of meat, the people of Ayntab also prepared Lenten, vegetarian dolmas. Chop the tomatoes and onions, mix with the other ingredients, fill into the eggplants, which must be hollowed out, arrange in a pot, add the sumac water, then enough water to cover the dolmas. Cover the pan with a heavy tray, and cook. Serve with tan (doogh), onions, and most importantly, the broth in which the dolmas were cooked, which should be oily, spicy, and sour. Chop the tomatoes and onions, mix with the remaining ingredients, then fill into the ajjours, which must be hollowed out. Arrange in the pan, add the verjuice, then enough water to cover the dolmas. Place a heavy tray on top, then cook. Serve with garlic yogurt on the side. Zucchini dolma is prepared using the same directions. Fry the onions and add the remaining ingredients. Fill theseingredients into the hollowed-out peppers and the eggplants. Arrange the dolmas around the pot, then add enough water to cover the dolmas. Cover the pot with a heavy tray, and cook. Add warm water to the tahini to make a paste, add the mashed garlic, and pour over the dolmas before serving. Arrange some of the garlic and the mint leaves at the bottom of a pot. Mix the remaining ingredients, and roll in the grape leaves. Arrange the grape leaves in the pot, add enough water to cover the sarmas, cover the pan with a heavy tray, and cook. Dip into yogurt while eating. Prepare the dough, making it soft, but not sticky. Roll into 8 or 10 apricot-sized balls. Allow the balls of dough to rest. Chop the walnuts, mix with the ground cinnamon, and melt the butter. Flatten the dough to the thickness of lavash bread, place on a pan in layers, and spread the butter onto it. Spread the chopped walnuts onto the fifth layer, then continue layering the dough. Slice as desired. Bake at a medium temperature in an oven, until the top of it reddens. Mix honey in cool water, and when the baklava is taken out of the oven, pour the honey water over it and allow it to absorb. Mix the walnuts, sugar, and cinnamon. Boil the water with sugar and lemon juice. Knead the phyllo dough with melted butter. Spread half of the dough on the bottom of a pan, and flatten. On top of it, add the walnuts, then cover with the remaining dough. Apply pressure with the palm and flatten. Bake in the oven, until it turns gold. Once taken out of the oven, pour cool sugar-water over it. The same ingredients are used to prepare milk skin kunefe. For that dish, the walnut filling is boiled in milk and then mixed with farina and milk skin, in addition to the chopped walnuts and cinnamon. Goulmakh was prepared by mixing the flour in a generous amount of oil, then serving the dessert as morsels. Grape molasses halvase was also prepared by following the same directions, but at the very end, grape molasses were added. Another very popular dessert in Ayntab was grape molasses with tahini, which was prepared by mixing the grape molasses and tahini and serving it with bread. Mix the flour and oil, until the color of the mixture is dark. Meanwhile, add water, sugar, and lemon juice to the mixture. Once the mixture starts turning gold, pour it onto a moist, flat tray. After it cools down a bit, and it is possible to touch it without burning the fingers, knead for some time, then roll into balls, flatten, add additional flour and continue to knead, while rolling the dough over itself. Cut into small pieces and serve. Dissolve the farina in water, mix with the other ingredients, and cook. The resulting helva should be brittle. Serve with bread. Boil the rice with the milk. When it is ready, mix the farina, water, and sugar, and add to the boiled rice. Continue boiling. This dessert may be served hot or cold, with ground cinnamon as a garnish. Boil the rice with the orange peel and cinnamon stick. Mix the sugar into the rice right before removing it from the fire. Boil the rice, then add the chopped walnuts and grape molasses. Anachorbase, or sweet soup, was usually prepared on the occasion of a baptism. Boil the rice, and add the seasonings to the water. After it cools down, add the honey and walnuts, and serve in small bowls. Burn the sugar, until it turns gold, add to the water, and boil. Dissolve the farina with some water, and then add it to the boiling sugar water. Season with mahleb. Boil until it thickens. When serving, garnish with walnuts. This dessert was also called khapisa, and was usually prepared for pregnant women. Dissolve the farina in cold water, add the grape molasses and mahleb, then boil. Before serving, sprinkle with ground cinnamon and garnish with walnuts. The dish may be served with crumbs of bread fried in a pan. Dishhadig or agrahadig was prepared when a child teethed for the first time. Women would boil the wheat (or pounded wheat), then they would garnish it with sugar, ground cinnamon, walnuts, almonds, raisins, and nuts. Mix the simit in the oil, add the water and sugar, then boil with a stick of cinnamon in the pot. For 15 minutes boil while covered, until the oil floats to the surface. Pour into deep bowls then sprinkle with ground cinnamon. Suggested side dishes include dry bread and cheese. The people of Ayntab, like their compatriots in other parts of historic Armenia, diligently prepared winter preserves for their families. While working, they would exchange the customary well-wishes: “may you enjoy the taste,” “may it always be plentiful,” etc. When exchanging milk they would say “may the milk always be plentiful.” During the grape harvest they would once again say “may God reward you with plenty.” When kneading dough, they would make the sign of the cross on it, calling this gesture “khach-khouch.” After arranging preserves in their cellars, they would also hang a talisman in the cellars, in order to invite God’s blessings upon the preserves. 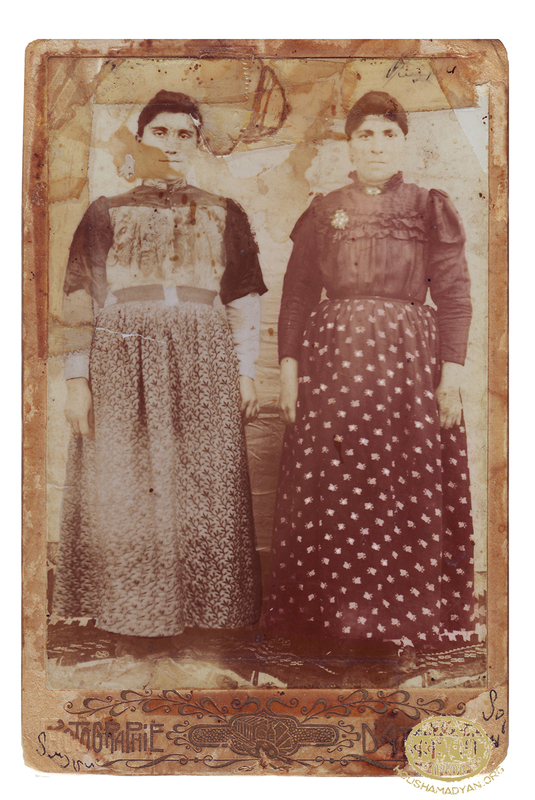 Pickles: using salt water, Ayntab Armenians made cucumber, khetan, and green pepper pickles. Vinegar: made by keeping apples and chickpeas in water. Verjuice: the juice of unripe grapes was boiled, then a few drops of oil were added to it immediately before pouring the liquid into jars. Pomegranate syrup: both sweet and sour pomegranates were boiled for a long time to make syrup. Grape molasses (Bekmez): prepared by boiling grape juice. Kevork Sarafian, Badmutyun Ayntebi Hayots (History of Armenians of Ayntab), Volume I, Los Angeles, 1953. Kevork Sarafian, Badmutyun Ayntebi Hayots, Volume II, Los Angeles, 1953. “Ayntabi Dohmig Or” (“Day of Celebration of Ayntab Armenian Heritage”), 1992, Saint Thomas Church, New Jersey. Day of Celebration of Ayntab Armenian Heritage, Hamazkayin, Beirut, 1980. Ayntabi Khohankirk (Cooking Book of Ayntab), 1998, Toronto. “Hye Ayntab” (“Armenian Ayntab”), Publishing by the Association of Ayntab Armenians, Year Seven, Aleppo, 1966. My gratitude to Mrs. Zepur Bilenjian-Yaralian, who has roots in Ayntab, as well as her mother and grandmother, for their assistance in verifying the recipes presented.